I thought a decent kick-off to this project could involve my being my own guinea pig, so to say, prior to sharing my thoughts and imagery connected to other couples, I perhaps should begin by sharing my own. 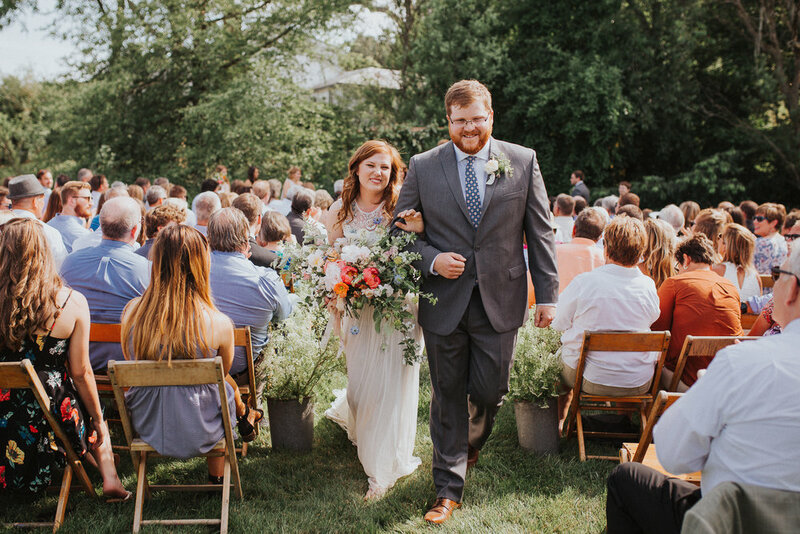 Brad and I were married last June 10th, at the captivating Warwick Farms in Mount Vernon, Ohio. 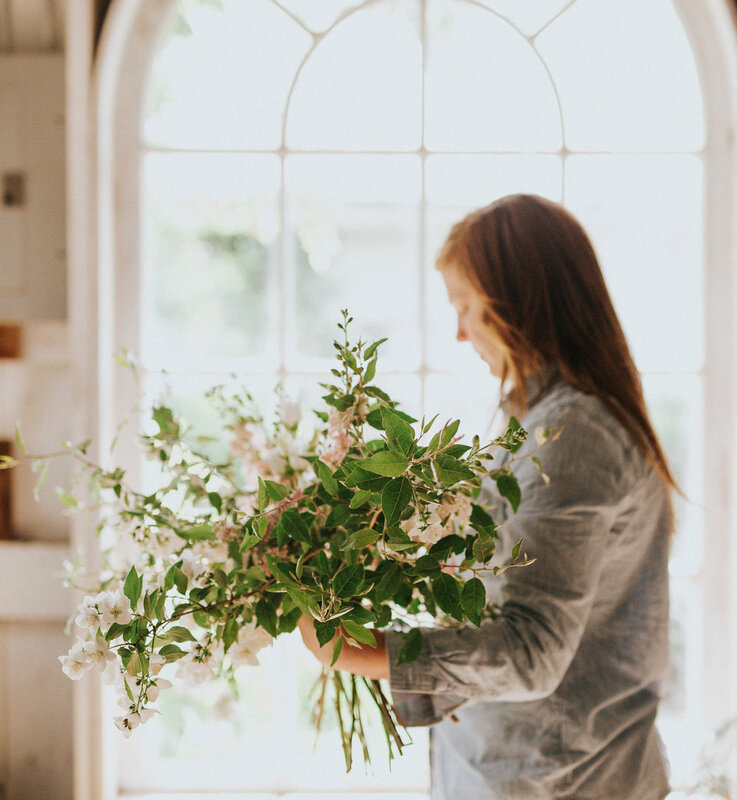 Warwick is home to the Price's, where Page and Greg have transformed their farm into an oasis of English-style gardens, complete with beautiful moments and copious birds and plants and animals, cozy interiors and a welcoming atmosphere. It couldn't have been a more perfect setting to begin our marriage. I, of course chose to arrange my own flowers for the event. 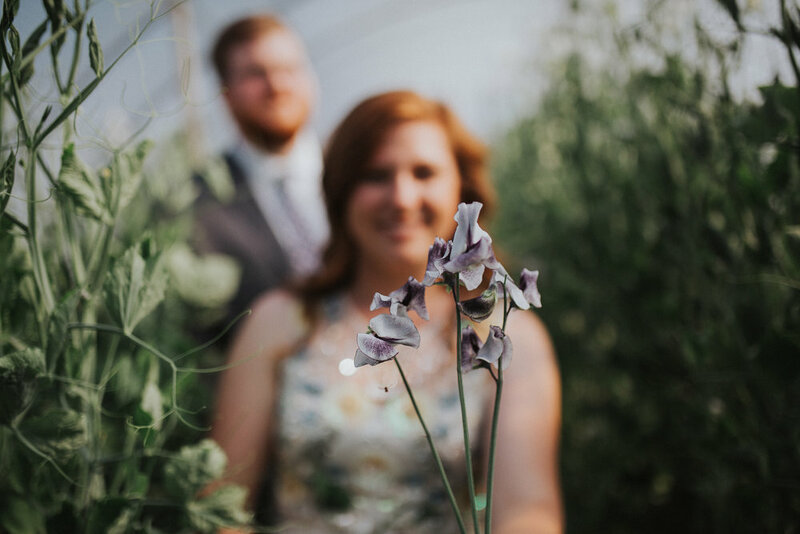 The week leading up to our wedding was a quiet frenzy of harvesting each and every usable stem from our farm and bringing bucket loads of the most exquisite poppies, larkspur, nigella, snapdragons, and so much more from Old Slate Farm to Warwick Farm. Page, the owner at Warwick, is a fellow florist and gardener. Her and I are kindred spirits, to put it mildly, and she has taught me and guided me through these early years of beginning my own business and farm. 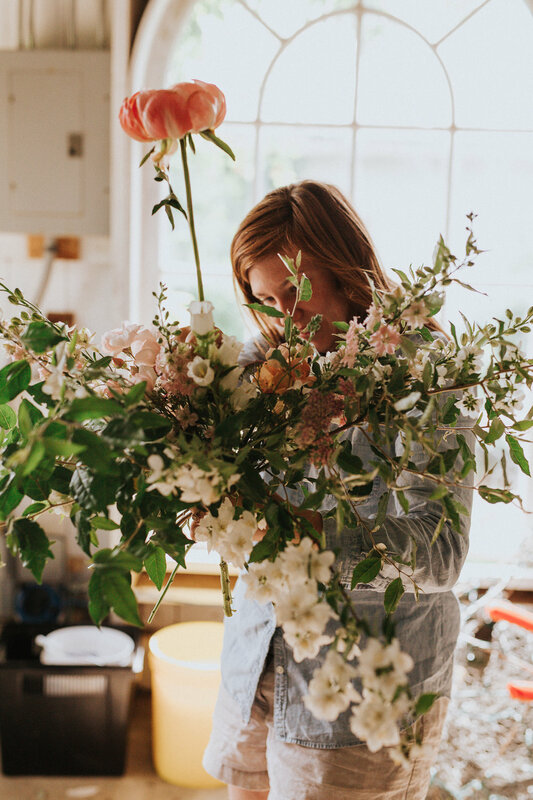 If there is a more inspiring floral design space in this world than Page's studio, I have yet to see it. It is an almost gluttonous experience to fill her space full of our flowers and design with reckless abandon, needing to fulfill nobody's wishes but my own. 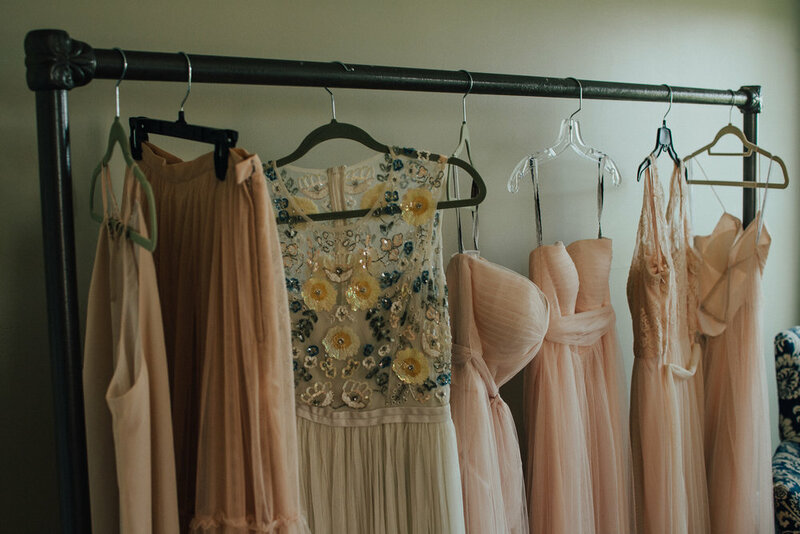 The morning of our wedding, I slipped away from the Champagne-sipping and makeup- applying to design my bouquet. It was just the quiet meditation I needed, admittedly, I was quite nervous (but also a bit excited) at the prospect of being the center of attention all day. Our photographer, Rachel (Rachel Joy Photos), made me feel so at ease throughout the entire day. We befriended her and her husband Adam upon meeting them for our consultation, and having a friend who is also a calming and wonderful presence was just spectacular, especially during these serene moments before the major events of the day began. 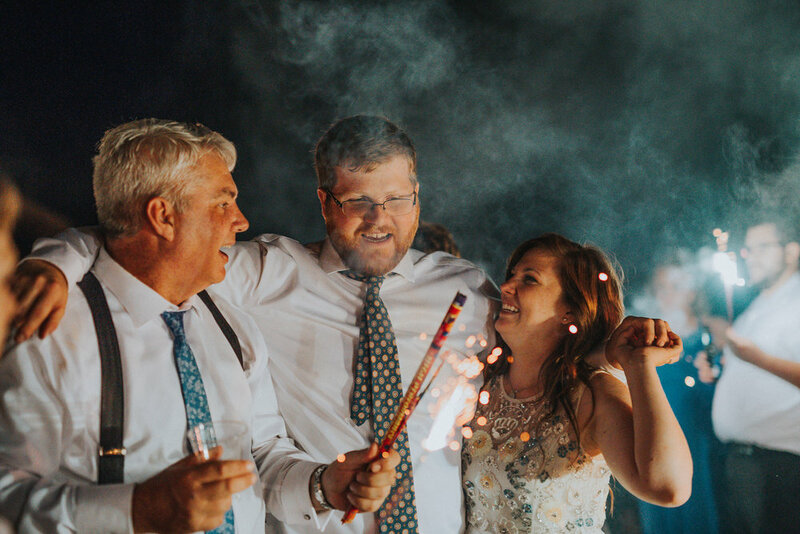 While I worked on the bouquet, Rachel captured these gorgeous photos and began taking pictures of some of the lovely details from our wedding. I feel very strongly about many things, and the power of beautiful paper goods is one of them. 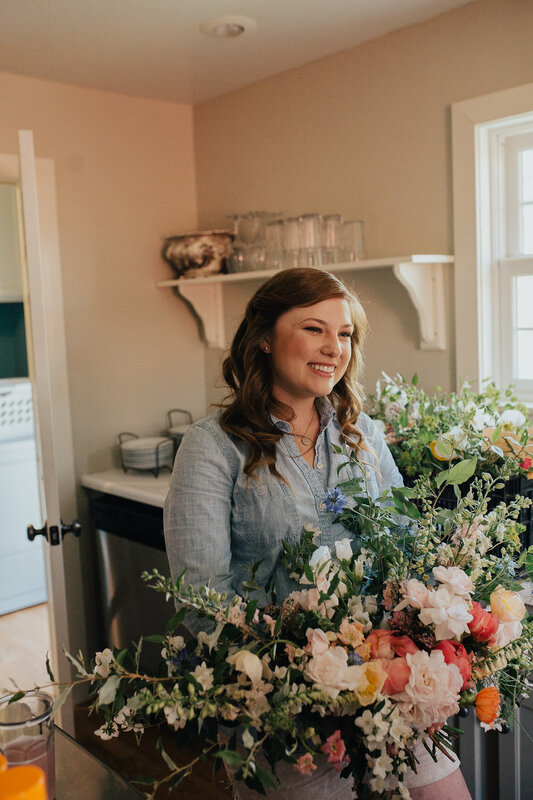 Luckily, I had a budding friendship with Meredith of Auburn and Ivory Creative, which has blossomed into a full-on, beautiful friendship and professional relationship. Meredith just has a way of understanding me. One look at our invitation says more than I possibly can. Our paper goods were beautiful. They set the tone for the day, had gorgeous watercolor of flowers and sheep (but of course! ), and a cheeky pun, a reminder to guests to not take too-seriously a wedding on a working farm. 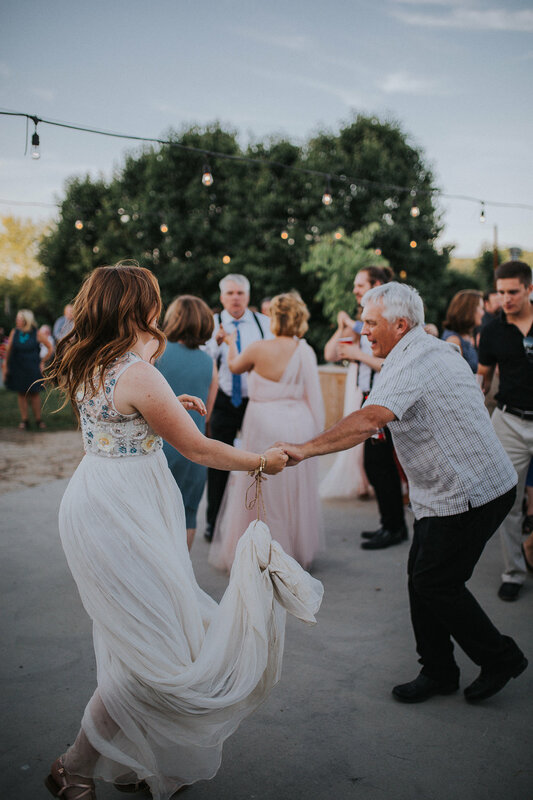 After completing my bouquet to my own satisfaction (and the confirmation from all in the room that it was in fact, 'obnoxious' - exactly what I was going for), I retreated back to the Warwick cottage to rejoin my friends and family, dress, and drink a bit more wine. It was then time for our first look. Brad and I have been inseparable, the greatest of friends, for almost a decade leading up to our wedding day. 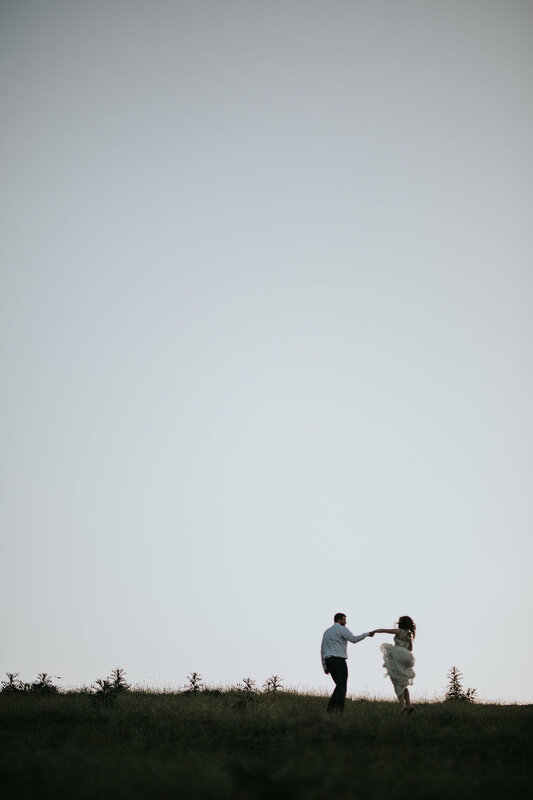 I have kept nothing from him, not a single feeling, thought, dream, my wedding dress (I showed him the link as soon as I bought it) nor he to I, so it was only natural that we spend time together prior to the ceremony. After a bit of time to ourselves, we were joined by friends and family just prior to the ceremony for portraits. Our ceremony was short, informal, but very beautiful and personal, thanks mostly to our dear friend Sean, who we met in college at Miami University. During a night of typical college debauchery, Sean announced that he wished to officiate our wedding. Four years later, we held him to it. Of course, the flowers were the MOST important aspect of this soiree, but closely after came the food. We raise almost all of our meats ourselves, and it didn't sit right to serve all of our guests meat from a factory farm. 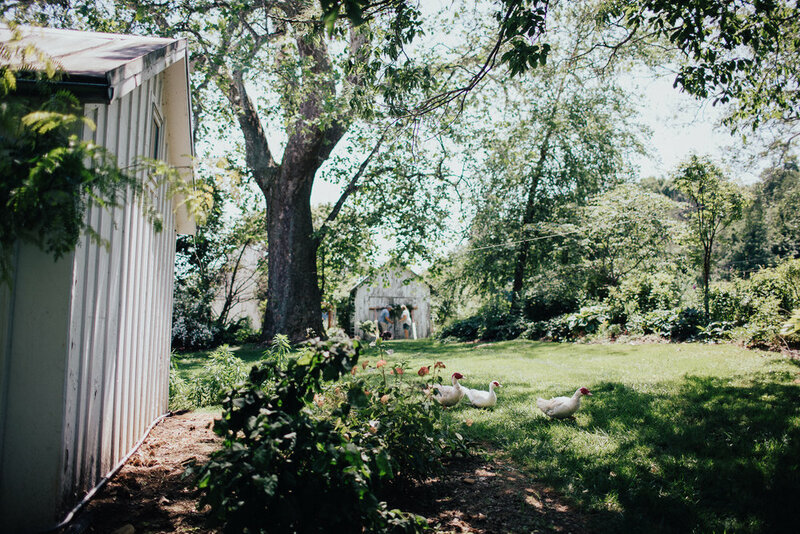 To ensure our standards were met, we raised the chicken for the meal at our farm, and found a caterer who was excited about accommodating our unusual request. The meal was served family-style, which always makes for some amusing platter passing conundrums, but a nice way for guests to interact and in my opinion, beats standing in a buffet line! Keeping table decor fairly understated helps your guests immensely with this dining format. While many aspects of our wedding were less than traditional, I insisted upon the big white cake. 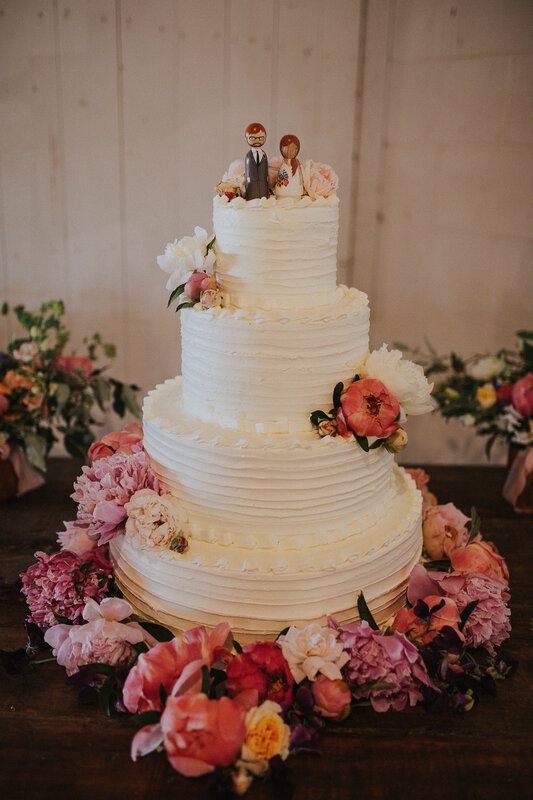 Wedding cakes are gorgeous works of art, and when executed perfectly (as ours was) are delightful. 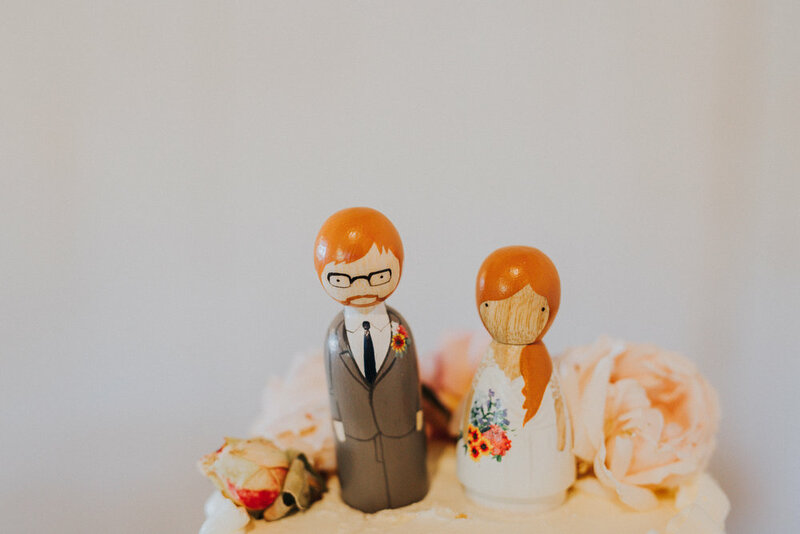 Dressed up with flowers, a cake becomes a statement piece, and our personalized peg doll toppers from Goose Grease were just the perfect little addition. I convinced Brad to step out during dinner to play in Page's hoophouse, which was overflowing with sweet peas. I cut some of my favorite: 'Nimbus' to add to the little trophy at my table - A vintage 'Miss Popularity' award, Mom and Page placed at my seat. An improvised bustle made of baling twine - essential. Sunset photos on the hill are a Warwick must. We led our friends on the trek for some more fun with Rachel and Adam. ...A handful of flaming, trebuchet launched watermelons too. And we danced some more under the light of the strawberry moon.